This paper describes a different approach to component fatigue testing on standard electrodynamics vibration machines. Fatigue testing uses loading of tested components under their resonance frequency with suitable modification of initial condition – especially geometry, fixing points and additional mass. The combination of FEM simulation and experimental validation of this method will be presented. A detailed description of more experimental examples shows the advantages and limitations of these methods, which are mainly suitable for small components with high rigidity. Driven by the growing deployment of active systems for ADAS and autonomous vehicles, rapidly increasing vehicle complexity poses significant test and validation challenges for developers. Moreover, to achieve competitiveness, these challenges must be overcome within condensed development cycles, using fewer human resources and physical prototypes. This presentation will explore industry examples of an innovative hybrid simulation approach that has been proved effective by MTS and its partners. It integrates computational models, physical hardware under test and human occupants into the simulation loop to extend the advantages of lab-based testing into early-stage development, facilitating more efficient, earlier acquisition of meaningful objective and subjective data. Do you want to learn about the opportunities and challenges of integrating electric vehicles with the electricity grid? And learn what tests should be performed to ensure an issue-free experience for customers? We welcome every test organization and EV(SE) manufacturer to join our presentation about smart charging, the impact charging can have on the grid power quality and why it is necessary to test on those subjects. EV(SE) manufacturers will learn how to prevent charging issues and get the most out of the electricity grid. Test houses will learn about new types of tests to add to their portfolios. Power measurements are challenging when it comes to complex hybrid systems consisting of various different components, such as multiple e-machines with more than three phases, gearboxes, inverters, batteries and a combustion engine. At the same time, other important signals like temperature and vibrations need to be acquired and stored as well. All power measurements should not only be doable at static set points to do a motor map, but also at highly dynamically changing loads like in WLTP testing processes. The paper presents a solution to these challenges: a modular dynamic drive power analyzer. Today’s vehicle manufacturing testing needs to address a variety of use cases to increase efficiency and reduce cost. Mahle’s TestLogiq, VAT, DL3 and NanoKernel offer a suite of hardware and software products to help increase the speed of vehicle testing (reduced cycle time) in plants by offering features such as location-based testing, tester software management and options for automated embedded test sequences. Such solutions need to minimize the use of vehicle battery charge, especially during downtime. Another major challenge is to implement data architecture that enables authored data reuse across various solutions, thereby minimizing overall system and labor costs. ITC Zlin is a private testing and certifying organization in the Czech Republic, with historic links to the Research Institute of Rubber and Plastic Technology, founded in 1956. ITC has historically focused on testing and certification of plastic and rubber products for various industries which include automotives, construction and building, toys, PPE, etc. Its physical laboratory offers services mainly for automotive and building products. Key activities include pressure, vibration and temperature testing of car components, such as cooling systems, evaporators, sensors, etc. The lab can also offer tailor-made solutions for combinations of various stress factors on products during testing. After their introduction in the aerospace industry, carbon-fiber materials (CFRP) are also becoming increasingly important in the automotive industry. CFRP components have a very low density with high stiffness and strength, which is an important advantage over metallic materials. Challenges in process reliability during manufacturing and assembly, however, require high testing and qualification standards. In addition to non-destructive testing (NDT), destructive tests and chemical analysis methods are used. If CFRP components fail despite extensive qualification, their cause must be clarified in a damage analysis. The lecture gives an overview of automotive and aerospace qualification strategies and presents results of damage analyses on CFRP components. Electric and hybrid vehicle development opens a new field of noise and vibration challenges. First, a quieter cabin environment, relieved from the ICE noise, lets new sources emerge. Those sources often generate low sound levels but with unworked sound design, thus providing a poor sound experience for passengers. The main propulsion motor plays a major role in the overall sound: its vibroacoustic behavior can be assessed and improved using the appropriate technology. 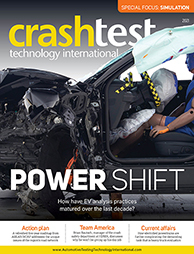 Globally, e-NVH requires a wide scope of dedicated skills and high-end tools: from simulation to testing. Parts made from metals, light metals, polymers, composites and hybrid materials are exposed to quasi-static and cyclic loading under service conditions, which results in a need for sufficient assessment of automotive materials and structures. Conventional testing procedures require high time and energy efforts and are limited in the extent of the results, since tensile tests and Woehler curves don’t show a sufficient measure to describe deformation and damage processes. Testing strategies are presented for efficient performance determination, deformation and damage propagation evaluation and lifetime prediction, combined with climatic influences. To successfully develop high-quality products in the automotive industry, manufacturers need to leverage the synergies of testing and simulation in the product development cycle. That is why engineers need efficient ways to bridge the gap between the two. The modal survey of electric sports car frames shows how simulation feeds test and how test feeds back simulation. The optimal locations of shakers and accelerometers were defined from the structural FEM by pre-test analysis, and the FEM was updated by correlating with modal test results. Tips on how to improve the efficiency of your modal survey will also be given. Cold-environment testing in the northern hemisphere has traditionally been carried out between November and April, to coincide with the winter season and avoid high shipping costs. Test World has recently extended the world’s first dedicated indoor winter test facilities to offer a valuable resource for year-round electric vehicle testing; for example, to test systems where battery performance is adversely affected by low ambient temperatures. 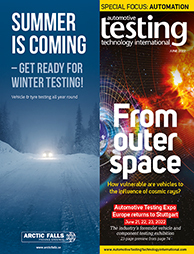 This presentation will show a range of cold-weather test scenarios that can be successfully carried out on electric vehicles at Test World – every day of the year. Product failures often require expensive repairs or replacements. Over-engineering adds to recurring costs, and its success is uncertain if the failure’s cause is not understood. Engineers need in-depth knowledge before attempting a redesign. This case study focuses on bus seat failures not predicted by industry standard tests. The goal was to collect comprehensive field vibration data and analyze it to understand the cause of the failure. The study used accelerometers placed at various points in multiple seating configurations and across multiple field environments. Analysis identified transmissibility issues between axes of motion, as well as higher-reliability seat configurations. A robust supply chain is one of the most important criteria in an OEM leadership’s approval for material qualification. The process of material qualification not only differs between car companies, but also is dependent on the type of material in question and the OEMs’ business and technology goals. OEMs do not want a risky single source of material for the product in question. This presentation addresses the challenges for material development and validation throughout the supply chain, and how to improve speed-to-market. Today lithium ion batteries (LIB) are the state-of-the-art technology for traction batteries in electric vehicles. However, the determination of the aging and performance of the LIB remains a challenge, since these essential parameters are highly dependent on the vehicle, user behaviour and environmental conditions. Therefore, LIB has to be tested in an efficient and sustainable way. In the presentation, a fully automated, cloud-based process is introduced, which includes the measurement of the LIB during operation, the generation of load profiles at cell level and transfer to battery test benches. Since 2017 engine developers have been challenged by statutory requirements for determining emissions under real driving conditions. This results in demand for statistical analysis of a vehicle’s emissions. IAV uses realistic, synthetic cycles for evaluating RDE compliance. All influences, such as driver, traffic and route, are implicitly considered. Also, worst-case cycles using algorithmic optimization are generated. The IAV method has proved effective in various projects for gasoline and diesel engine vehicles. Establishing a standard process for vehicle validation, IAV's engineers have developed the IAV Kagera software tool, which supports OEMs in fulfilling the comprehensive requirements in the new RDE exhaust legislation. Automotive testing applications, especially in in-line or end-of-line systems, need to maintain a high level of availability. Therefore, it is essential to know the exact condition of the testing equipment. With its process data monitoring system, Hainzl provides a comprehensive monitoring solution based on existing data from the automation system and additional sensors as well as automatic data analytics. The system can be extended with vibration analysis and fluid monitoring of hydraulic units as well, and can also be easily retrofitted to existing equipment. Long-term trend analysis and data correlation ensure on-time alarms in case of recognized deviations, and enable cost-reduced maintenance and optimized testing procedures. No matter the size of your application, on average only 5% of the data being collected is analyzed. This data could be anything from system configuration files, through metadata up to your final acquired values and further calculations. When it comes to deriving knowledge, all your data is key to gaining a competitive edge. In this session, learn how you can increase your efficiency in analyzing and visualizing engineering data that scales from an individual user to the enterprise. The presentation will discuss data mining for predictive maintenance; transformation from big data to smart data; analytics of vibration, revolution speed and temperature; clustering; and machine learning. Development needs are shifting toward more complex solutions and it is certain that most of the industry will adopt this transition. Emission legislation is also pushing for more testing in real conditions. A concrete example here is the in-service-monitoring testing for the current Stage V legislation. For the test to be valid, boundary conditions must be taken into account. Machines often operate in remote locations with a specifically trained operator. Therefore, the testing engineers want to monitor the testing remotely and in real time, as well as to be able to guide the operator in case action must be taken. The regulatory and ethical demands of RDE result in increased levels of development activity that make it impractical and non-viable to sustain planned new product introduction programs within reasonable commercial expectations. The use of virtual tools, advanced testing techniques and test hardware will provide relief from the automotive industry’s latest headache. Powertrain and vehicle simulation, linked directly to engine hardware, will allow development and calibration to cover the new, wider boundaries of the RDE universe. Coupled with new climatic testing technology, physical validation can be accomplished wihin the laboratory, leaving the road for final verification and delivering RDE in good time. Achieving full test coverage of all new products related to new powertrain technologies requires very high investment. As testing often does not produce a noticeable advantage for the end-user experience, the demands of managers and decision makers to decrease investments in this field are very high. Therefore, Power Test Solutions is constantly looking for the world's most competitive and forward-looking companies and testing solutions in the field of power electronics testing. As an example, Power Test Solutions presents new capacities for testing equipment, introducing some of Kewell Power Systems' products available for the European market. The merging of x-ray and (hyper)spectral imaging technology enables the next generation of non-destructive testing (NDT). A new generation of x-ray imagers is now able to deliver very high contrasts and dynamics, as well as element differentiation due to energy (spectral) sensitivity of the pixels. Unlike traditional hyperspectral imaging, this generates an insight into the measured objects beyond the surface area. This talk will discuss how this new generation of imagers can be utilized in automotive testing for identifying defects and material distribution in composites and other mixed-material structures for in-line quality control and research and development. Hardware-in-the-loop simulation is well established and widely applied for verification and validation of automotive software. Furthermore, most OEMs and suppliers are introducing virtual validation using software-in-the-loop simulations. At the same time the whole automotive industry is moving toward agile processes and introducing continuous integration and testing workflows. What is the role of hardware-in-the-loop simulation with regard to the shift to continuous integration and testing? How can hardware-in-the-loop simulation be applied in agile organizations and support agile development processes? And how does this move toward agile affect the introduction of software-in-the-loop simulations? This presentation will discuss these questions. Vehicle thermal management and air-conditioning systems play an important role in protecting the driver and passengers from pollution ingress into the vehicle, and from the build up of carbon dioxide in the cabin. With air pollution in excess of legal limits and World Health Organization guidelines in many areas across Europe, drivers may be particularly susceptible. Emissions Analytics will present test results from testing over 100 passenger cars, measuring ultra-fine particulates entering the vehicle, and CO2 levels which can cause drowsiness. Today’s infotainment, telematics and car radio systems are increasingly sophisticated, offering mobile users a wide range of connectivity, navigation and audio options. With all the new technology and features appearing on the market, OEMs and auto makers are racing to integrate them. A key to leading this growing market is fast, comprehensive and efficient parallel testing of all the integrated technologies. This presentation gives a high-level overview of some of today’s major infotainment trends and presents how a renowned car maker gets ahead of the market by relying on a signal tester and Averna’s test expertise. Elastomeric mounts are a key component of NVH control, especially in the automotive sector. They decouple high-frequency vibration coming from the tire-street contact or vibrations from the (electric) engine. Electric drivetrains boost the demand for high-end elastomeric components because the combustion engine as main noise emitter is obsolete and other noise-emitting sources come to the fore. This speech presents the state-of-the-art testing technology of those mounts for high-frequency characterization of dynamic stiffness. Common advantages and limitations of this method will be addressed. Finally, an approach for modeling of elastomeric mounts will be presented. With increasing bandwidth and noise immunity demand from automotive Ethernet cables, it is increasingly important to test the RF performance of the cables before installation in the vehicle. Stringent requirements for signal balance parameters as well as transmission parameters necessitate a sophisticated test setup. This talk covers the issues related to cable performance testing and practical implementation of test systems in manufacturing floors. HV storage systems must meet increasingly heavy demands. They are becoming more and more powerful, with higher capacities and higher charging voltages or currents, thanks to appropriate source-sink systems as well as state-of-the-art programs to test this new technology. HVSP records and evaluates measured values so that they can be reproduced at any time and used for the necessary quality control. Security-relevant data is precisely logged and can be transferred to various database systems. The safe and simple operation of the test system guarantees worker safety and prevents possible sources of error. The use of real-time or accelerated life tests in new component development is intended to identify potential weakness of the design during service life. The presentation will discuss the methodology of durability assessment and testing based on the application of Miner’s cumulative damage approach for poly V belt (thermal fatigue) and tensioner (bearing contact fatigue). The approach is applicable for durability assessment and testing of bi-directional drive subsystems applied in hybrid solutions operated in different modes e.g. diesel and electric motor–generator. A typical automotive application is the belt starter generator to provide start, electricity generation and power assistance functions. Accurate measurement of the aerosol particle number concentration is becoming increasingly important in many areas and has been recently introduced in vehicle emission legislation. Number concentration measurements are also integrated in particle size distribution measurements. The increasing importance of aerosol metrology implies the need for traceable calibration services for particle measuring devices. METAS has developed traceable calibration methods and performance tests for particle counters, particle analyzers, dilution systems, volatile particle removers. In this presentation we will convey the basic principles of aerosol instrument calibration and report on the measurement uncertainties that can be experimentally attained. Modern HIL systems are significant investments and therefore demand the highest grade of utilization, meaning high uptime and low idle time. Yet many HIL systems can’t make efficient use of all available testing time overnight and at weekends, due to a lack of test case numbers for one specific variation of ECU hardware. By allowing the connection of a multitude of different ECU variations to one HIL at once, and enabling the remote-controlled changeover of automated testing tools, orangeSwitch offers a solution for maximizing overnight and weekend test time per HIL. Several different ECUs can be tested with one HIL during one overnight run. Nitrogen is needed to prevent explosions when potentially hazardous appliances are being assessed. Examples include the testing of powertrains, vehicle electronics or batteries, to name a few. What is the most convenient nitrogen source available for these tests? Conventional liquid nitrogen needs to be stored in tanks or bottles, filled up and carried even when empty. The most convenient and nearest N2 source is the ambient air all around. This is what INMATEC offers: on-site nitrogen production out of compressed ambient air with customized quality and quantity. With over 50 years' expertise in the field of automotive safety, Messring wants to drive the future of advanced safety testing and safer mobility. That’s why the company is pushing modern technologies to make them fit for active safety. One of these developments is the M=Brake system. The main objective of the system is to simulate emergency braking before a collision in non-destructive sled tests and standard crash tests with vehicles. Testing with the M=Brake system results in more realistic test data due to the extra car pitching and dummy displacement, as in a real traffic accident. Modern cars contain different automotive bus systems such as CAN, CAN FD and LIN, which were defined and developed before cars were connected to the internet and cloud services. As a result, most automotive bus systems have been developed without considering aspects of security such as authenticated communication. In today’s vehicles, the lack of authentication methods for communicating across automotive bus systems has made the connected car a potential target for easy hacker attacks. Car makers and Tier 1 suppliers have meanwhile recognized the importance of having authenticated communication within the car, and are supporting it in new developments to prevent unauthorized access to vehicles. This presentation will demonstrate a set of tools that simplify testing, analyzing or verifying devices that use CAN-authenticated communication. Test laboratories perform a wide variety of tests including static strength, dynamic performance characterization and fatigue life. With fatigue life tests, components and systems made up of different materials may degrade or wear out at different times, which then causes secondary part failures. Understanding this process, and recording information to track the changes, is necessary to document high-quality test results. The presentation will cover example test methodologies beginning with data acquisition, through to road data reproduction and tools used to run and monitor a well-documented test. A printed circuit board is integrated in every kind of electronic device. In this era, 'electricity' has been a key term in the automotive industry. As the technology for electrically powered vehicles and internet-connected cars has developed, the reliability of core battery parts, and the development and assembly process for PCBs, has been a concern for automotive quality assurance. In this presentation we will show our development of a data acquisition and analysis system that is particularly useful for PCB stress and failure analysis in the assembly and development phase. By showing our specific application example, we will reveal how our product can be used for quality assurance of printed circuit boards. Although scenario simulation tools are good for virtual testing, 3D rendered scenes can be misinterpreted by algorithms designed for the real world. Record field data from ADAS sensors that can be played back in the lab to simulate driving and increase test repeatability and coverage; stream up to roughly 15GB/s of data within a single system, using RAID storage options; synchronize interfaces such as automotive networks, camera interfaces, radar, etc, down to microseconds by leveraging a modular hardware platform: ultimately, this platform allows the same system architecture to be used to play back the recorded field data to validate algorithms through HIL.